The play tipi is a great attraction for children. Whether you have it in your garden, in the kindergarten or at an Indian festivity, children will take much pleasure in this tipi. The play tipi is a round tent which is sewed after the original of the real tipi. You can find two smoke flaps at the tent but the doorway (about 0, 70 m/ 2.30 ft.) is made as a slot, which can be closed with a rope. There is no lacing pin strip at the tent. The tipi tent is made of extremely tough cotton (impregnated against water and mud). It can be cleaned like normal cotton. The tent is receivable in the standard sizes with a diameter of 1,80 m/ 5.91 ft. or 2,20 m/ 7.22 ft. Custom-made products between these two sizes can be made. The standard framework, which is made of bamboos, is already bond together. The height of the builded tent is Ø 1,80 m (5.91 ft.) / 2,60 m (8.53 ft.), including poles it is about 2,10 m (6.89 ft.) / 3,00 m (9.84 ft.). The height up to the point where the poles are bond together is about 1,65 m (5.41 ft.) / 2,40 m (7.87 ft.). You will have a lot of fun designing your play tipi with your own ideas together with your children. Of course we will help you to find Indian ideas and accessories. 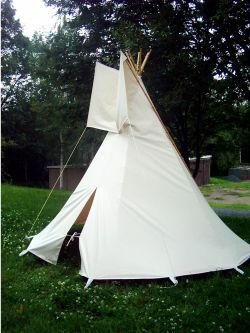 An already painted play tipi is also available, if desired.